Stepping up my game and taking my momiform to the next level with a kimono. Like on the daily. 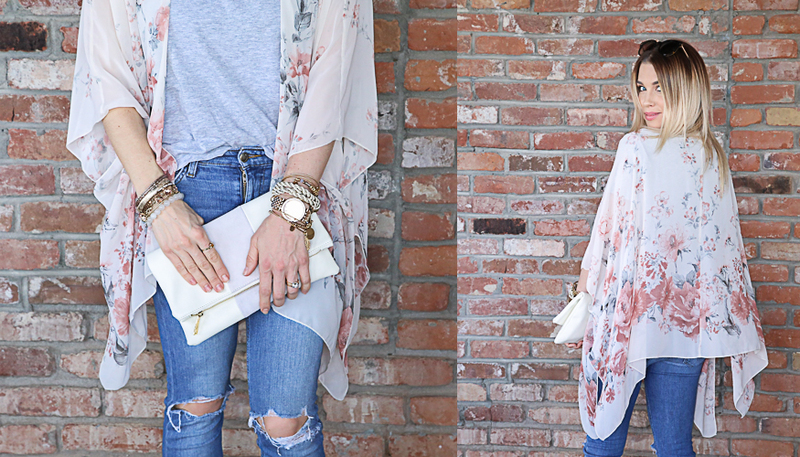 Throwing on a kimono is the simplest way to jazz up an everyday look and give it just a bit more: more pulled together, more thought out, more than your typical momming-around-town outfit. It adds that extra oomf without any extra thought. I’m a sucker for jeans and a tee – mom duty or not. So a simple addition that adds maximum effect is something I am all about. 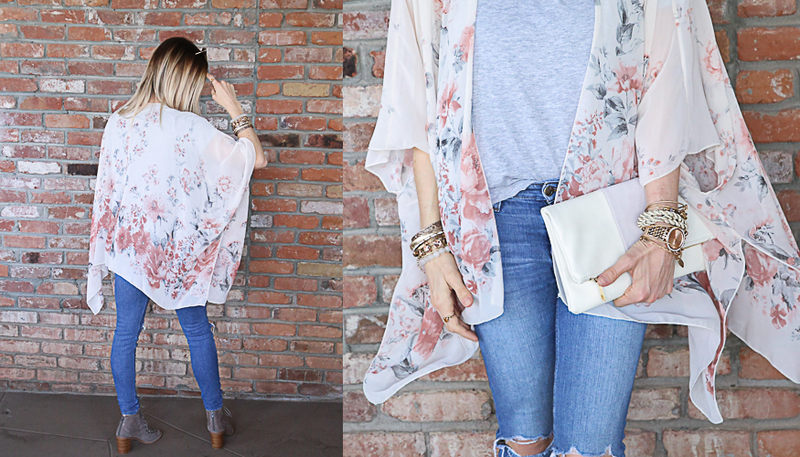 Look at how easily this grey shirt and ripped knee denim was transformed when adding this kimono….Easy peasy, lemon squeezy. Let’s not forget to mention that this muted rose and grey floral is perfect for spring time. It’s not an overpowering print; it’s subtlety gives the illusion of effortless style. I mean seriously, what could possibly be easier than this? Aside from, oh I don’t know…..my baby actually sleeping through the night and eliminating my daily reliance on two types of under eye concealer? Anyways, short story long, next time you’re looking to step up your outfit game with a simple, yet impactful solution– just throw a kimono over it. Off for some brunching at the local mom and pop I go! Oh, and you should probably go check out all these amazing kimonos ! I swear Pink Blush has the cutest and most affordable kimonos ever. Thank you so very much! I greatly appreciate your kind words for encouragement.